When using your microscope you may run into a few problems once in a while. Below are some hints for ensuring that the image seen through your microscope is clear and in-focus. Problem #1: Trouble viewing anything at the highest magnification. Solution: Make sure you focus on the image at the lowest magnification first, then move up to the higher magnifications. Problem #2: There is a black spot in my field of view. Solution: Try moving the slide while looking through the microscope. Does the spot move? If so, clean your microscope slide or cover slip. If the spot does not move, rotate your eyepiece. Did the spot move? If so clean your eyepiece. If not, clean your objective lens. A microscope cleaning kit is good to have on hand. Problem #3: Image is very dark through the eyepiece. Solution: Check to make sure that the light is turned on. Is the rheostat control on the light really low? Try turning it up higher. Is the diaphragm open? If not open it up slowly as you look through the eyepiece. Is there a filter covering the light? If so, remove it. 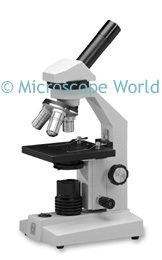 Problem #4: When looking through the microscope eyepiece the image looks like a half moon - one half is dark. Solution: Check to make sure that your objective lens is clicked fully into position. Can't figure out something else? Send us an email and we will try to help you out.